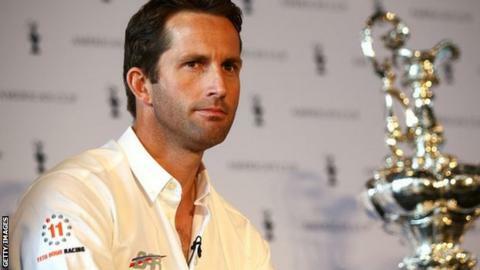 Four-time Olympic gold medalist Sir Ben Ainslie says he hopes basing his America's Cup team in Portsmouth will leave a legacy on the south coast. He is spearheading Britain's bid to win the 35th America's Cup in 2017. Ainslie, 37, won the race with Oracle Team USA last year and will captain a GB team for the next event. "Through this team we really have an opportunity to raise the profile of sailing and the marine industry in the south coast," Ainslie told BBC South. He has set up the Ben Ainslie Trust, helping to create more than 1,000 jobs in Portsmouth. The Duchess of Cambridge is a patron, while Sir Keith Mills, who was deputy chair of the London 2012 Olympic organising committee, has been installed as chairman. "We really wanted to be here in Portsmouth, because not only is it a fantastic sailing venue to race and train, but we also wanted to integrate in the local community and we are extremely grateful for their support in hosting us," Ainslie added. No British team has won it, but Sir Ben Ainslie is hoping to change that with his new team. As holders, Oracle Team USA have revamped the format, qualifying rounds have been streamlined and will start in 2015. The finals are likely to be in June 2017. "We can get young people into our team base and inspiring them to get out on the water, doing apprenticeships and hopefully creating jobs. "We are industry leaders in the marine world and this gives us an opportunity to showcase that and get the message out there that there is a job in sailing. The more people we can reach out to - that is our goal." "Our team base will be in operation next May," he said. "And we are just about to start with our first testing boat in the Solent at the end of the week. There is a huge amount going on. That's quite a milestone for the design and boat building team. "Obviously there's a long way to go but we're very happy with the progress being made and where we are at the moment. "We'll never be ahead of our plans until we've won the America's Cup, but certainly we're happy with the progress that's being made, and it's a huge effort from everyone involved."